I’ve been wanting to try to bake with Quinoa flour. It has taken a little adjusting and trying. The first time I tried baking, the whole batch got a thumbs DOWN from those that matter the most (the kids). The second time however, I think we got it right. These cookies were gone within minutes. Keep in mind, while they aren’t sugar free, they offer a little extra nutrients, like a bit of protein from the quinoa flour, for your kids. If I don’t like a specific food, I probably won’t make my kids eat it no matter how healthy it is. There are too many delicious foods out there that are healthy, why include the not so good ones. Life is too short. But then, there are certain foods that I used to not care for, but over time, found I really like it. That’s what happened with Quinoa! ll nine essential amino acids. So if you are vegetarian, this would be a good food to include in your diets. But if your kids eat enough hot dogs and processed lunch meat like mine, they are probably fine in the protein department. I just think there are other grains that are more versatile, more flavorful, and more palatable all around. Of all the recipes I looked up, there was only a handful of ways people prepare quinoa. I cooked it in a similar way to rice, except I sauteed 1 cup of the grain in some butter, then added two cups chicken broth and simmered till the liquid was absorbed. Other ideas to eat Quinoa is to use it on salads, stuffings, enchiladas, fajitas or salsa’s. But, luckily, there is also quinoa flour! 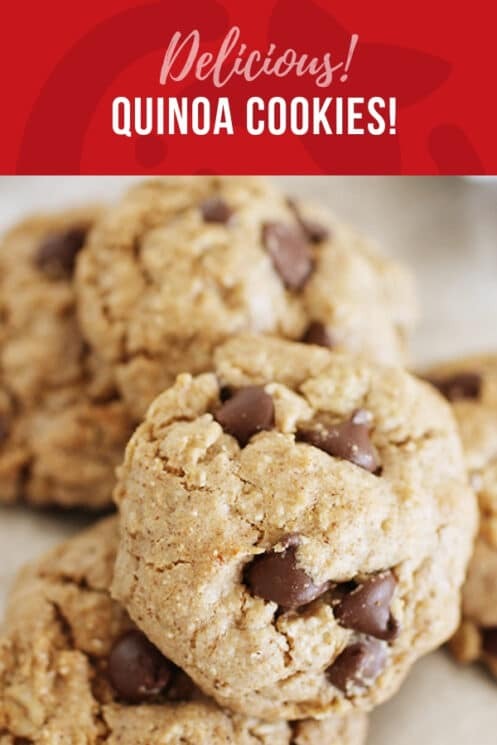 Ground up quinoa that has the consistency of flour can be used to include in baked goods, either as a substitute for wheat flour, or in addition to wheat flour. That’s how we made these cookies, which I like to call QUOOKIES! In a large mixing bowl, whisk together oil, egg and vanilla. Add sugar and mix thoroughly. Add flours, baking powder and oats and completely mix in with wet ingredients. 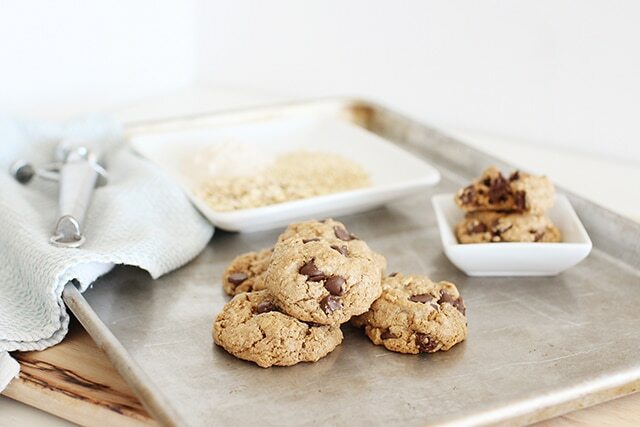 Scoop out by tablespoons on to a baking sheet placing cookies 1 inch apart. 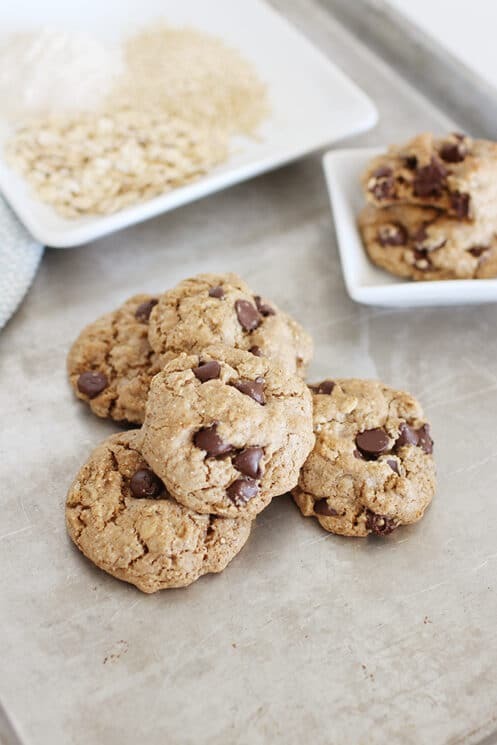 Bake for 8-10 minutes, cooking less for a softer cookie and longer for a crispier bite. YES! Many gluten free products in the stores are made with Quinoa flour. The cookies obviously aren’t because I used the wheat flour. Did you buy quinoa flour, or did you grind the quinoa into flour? I’ve been wanting to try quinoa, but it’s so expensive and I haven’t been able to find it for a reasonable price. Great idea! These cookies look very tasty. 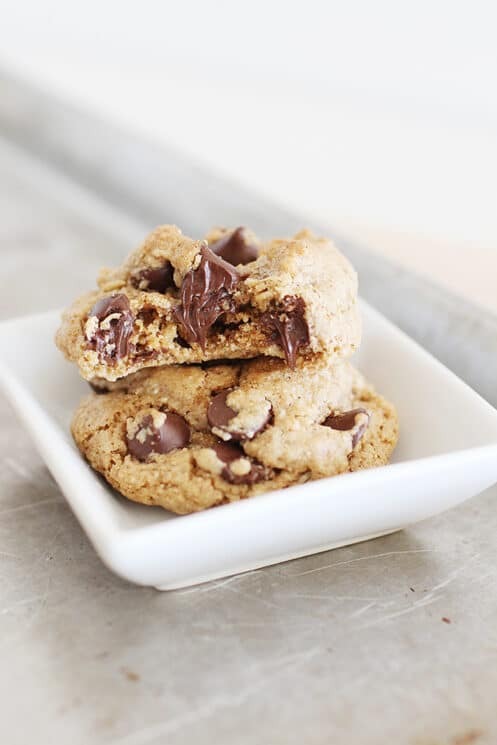 You know, you could use quinoa as a flour replacement for any recipe that doesn’t use flour as a main ingredient. I’ve used brown rice flour in brownies (fudgy ones) and as batter for baked veggies and chicken with great success. I’ve never used quinoa flour, but I think that I’ll have to get some the next time I’m at the store. Now I think that I’ll have to experiment with how much regular flour I can replace with quinoa flour and still have good results! BTW, love the title. Quookies – inspired! Catherine: I did not grind the Quinoa. I considered it, but I returned the wheat grinder I was using to my mother in law. I’m so bummed, cause I think it would be cheaper to buy whole quinoa and grind. Yes, very expensive! you can get quinoa flakes and grind them in the blender, super fast. Or you can grind the grain in the blender too it just takes a long time. But it is much less. Thank You Jessica, I was wondering if it would work in a blender! Oh and for those who cannot eat eggs. I did use a 1/2 of a banana and 2tsp of ground flax and they turned out well texture wise. And I didn’t use the chocolate and they were still great. Which is better for you canola oil or olive oil? 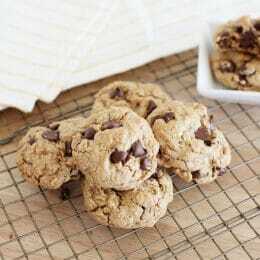 I have a recipe for breakfast cookies that calls for canola oil as well. Is it lighter? The way I have understand it: There is more of the good fat in Olive oil (but only by a small amount). So technically, olive oil has a nutritional advantage. However, I generally use Olive oil for sautéing and cooking things on a skillet, but I use canola oil in baking (rather than butter or vegetable oil). Mostly for the taste. I think olive oil leaves a different taste in baked goods. These look so awesome! We love quinoa and I would for sure use Kamut Khorasan Wheat flour too for added nutrients!! Thanks so much 🙂 I cannot wait to try these! 😉 I’m goiong to return yet again since I bookmarked it. I did not have success with these either. I could not get them to stick together but proceeded to bake anyway. They just fall apart and my kids don’t like them as we cannot hold them in our hand. Had to use a spoon they’re so crumbly. They taste good, just too dry and they fall to pieces. @jessica & @sarah- did you use quinoa flour? Did you grind it yourself or purchase it that way?